In Winchelsea, in a garden looking towards Rye, both ‘ports of stranded pride’ in the Romney Marsh landscape as tagged by Rudyard Kipling. Years ago, in Roman and Norman times, both towns were ports where the sea washed this land. I like the effect that the iphone pix have when fiddled with in instagram software – just playing around, of course. Looking within and beyond the site, wondering what to do with it . . . noting the structure of the trees, hedging, spatial areas in the winter landscape. My knowledge of Winchelsea is just about OK but I thought to roam around the outlaying landscape to breathe in a little more . . . .
. . . down Monks Walk towards Wickham Manor Farm, the road passes under the New Gate. A flock huddled around the structure – looked interested and then quickly looked bored – picturesque nevertheless. These pastures were owned by William Penn. . . .and below is a wall of an almshouse. Stunning as a landmark now but humble as a piece of construction. The views framed by the streetscape (horrible planners terminology) must have been fairly breathtaking before the arrival of the car and vehicle parking lining each street. I had to crop out the cars to get a feel of how things were – not much left but . . .
. . . attached to the gable of the Old Court Hall is an elaborate piece of metalwork that may have been a hoist or . . . .
. . . and the other major building standing slap bang in the middle of the town is the church – the new church as the previous late 12C building was battered by high tides and, in the mid 13C, and finally destroyed by floods that changed the course of the river Rother. Edward 1 was instrumental in the siting of the ‘new town’. It remains unclear whether the arches that stand like wings were left incomplete or left to fall as ruins on this 2 acre site . . . lovely stone from Normandy. Humble head gently overseeing all who pass through the grounds. Some thoughts and experiences to ruminate on – useful and thanks to the small town with a modest but well heeled character. Yearns to its fellow clay. 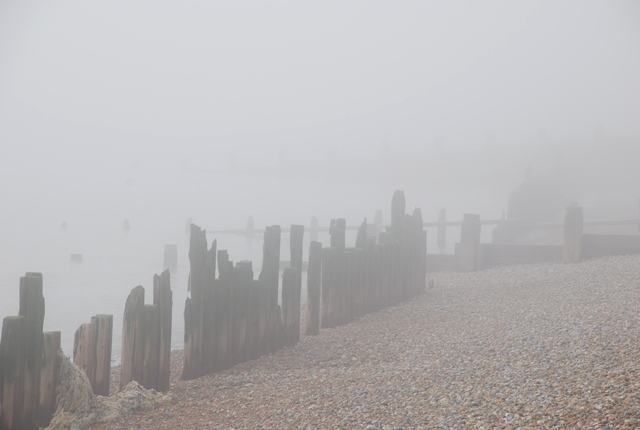 A visit to Rye – to the dentist – just by the church. Amusing comments from others in the waiting room – “it’s just the thought of the dentists that makes one feel nervous” – ” I’ve never really been hurt” – ” I dread it”. Fortunately, for me, it’s never a bad experience as luckily my dentist is brilliant. 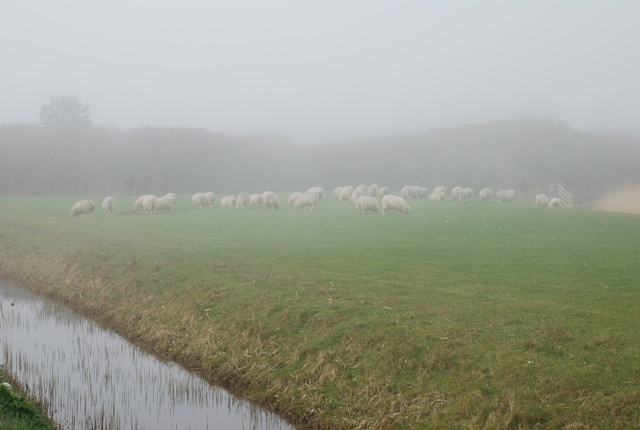 I wander down through the town walls feeling mellow rather like the sheep grazing on the marshes by the river Rother. Back on the road home – the Royal Military Road at the junction with Sea Road at the base of the Winchelsea hill, temporary traffic lights provide an opportunity to pause and view down the stretch of land carved out by the construction of the canal. 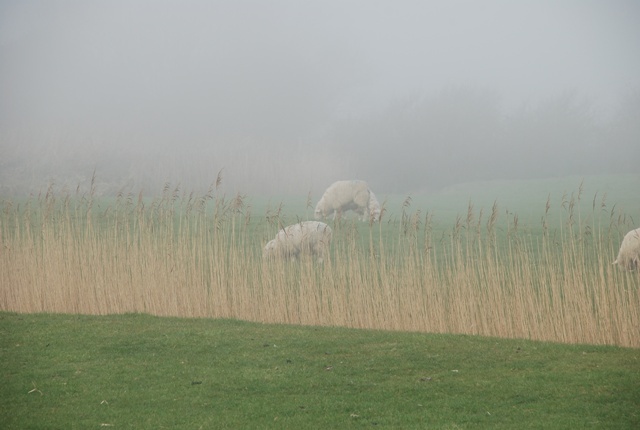 Beautiful tones on the rushes – but no sheep. Having negotiated the hair pin bends around the base of the town and started to pick up speed on the down hill run after Rectory Lane, a large flock came into view captured in the geometric areas formed by the network of ditches and streams . . . .
. . . quiet and ‘nothing to shout about’ willows line the stream . . . . The ancient mounds that hold the ridge of Monks’ Walk form a spectacular background. Off they scuttle – across my idea of a seventh heaven landscape. 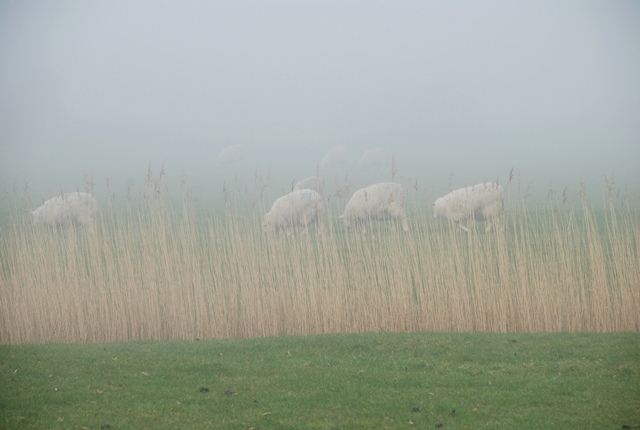 Another post more related to the poem and another about sheep and I’m not sure if Romney Marsh sheep had bells – but I do know who might know. On Romney Marsh above and the sea at Pett below.